A new study carried out by Leerdammer Light found that unsurprisingly the traditional lunch break is on the decline with us Brits working an 19.4 extra days as a result of not taking their full breaks, whilst a further 7% claiming they don’t take lunch breaks at all. which I can really identify with as I tend to grab small snacks rather then indulging in a proper lunch. The lack of the lunch hour is taking its toll on the nation’s productivity and well being at work, with 22 percent of people surveyed admitting they are less efficient when not taking a lunch break. With this in mind, Leerdammer Light wants to shake things up by offering tips and advice on how to get the most out of your lunch break that go beyond just making yourself a healthy meal. Leeddameer Light has teamed up with Karen Meager a leading workplace expert and has put together some simple tips that can help us get the best out of lunch breaks which will not only fill your tummy but will stimulate your mind body and spirit to enable a productive day. Relax-Eating your lunch at your desk is unhealthily, our bodies are not programmed to digest food well under stress,do its important to have lunch when relaxed, Take a few deep breathes before you start eating and eat slowly and chew your food well. Walk the walk - Taking a 15 minute walk around lunchtime to avoid the need for the gym workout later, plus its a great way to get your brain buzzing. Get the most out of your lunchtime by asking yourself "How can I.....,question yourself before you set out, asking questions followed by exercise encourages the mind creativity and will hep you come up with new answers. Tidy desk, tidy mind - use some of your break time to get organise. Having a clear out has an big impact on how we feel in our mind, if there is less clutter in our peripheral vision, we are more focused and energised and less mentally distracted. So with these amazing Tips some tasty lunchtime recipes from Leerdammer I'm hoping to change some of my lunch time habits this 2015. 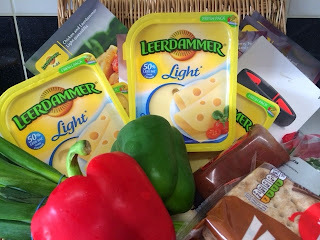 I recently found out that walking for only 15 minutes per day I can burn more then 40 calories, also what is great about Leerdammer Light is that is contains 50% less fat then cheddar cheese which makes it perfect for lunch as part of a healthy balanced diet. 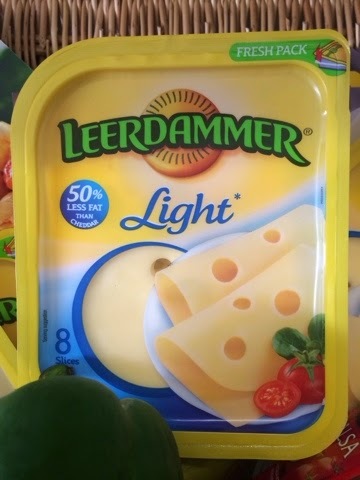 Here is one of my favorite Leerdammer Light recipes. 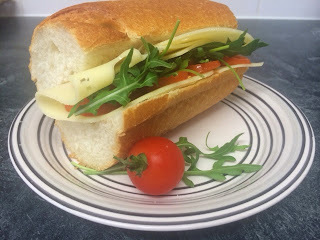 This Leerdammer baguette was absolutely delicious and was perfect for lunch, I really enjoyed Leerdammer cheese is is very light in texture and has a delicious nutty taste, I'm really looking forward to a more productive and tasty lunch break.